The previous article presented the basic theory behind the Authentication Proxy (Auth-proxy) functionality on Cisco IOS Software. The current post goes one step further, by bringing an example of a simple Authorization Profile that can be passed back to the router after successful authentication. It illustrates the authorization task ( a natural follow-on to authentication). Remember that mere authentication (without differentiating users by means of authorization) is virtually meaningless. In our particular scenario, the attributes downloaded (“proxyacl#“), correspond to individual Access Control Entries (ACEs) that have been configured beneath the user group to which user1 belongs. It shows how that the router is aware that Auth-proxy was the feature in charge of downloading the per-user ACEs. In a very similar fashion, the RADIUS server could had sent a Donwloadable ACL (DACL) to the router (instead of individual ACEs). Actually, many other attributes could have been passed to the router during the authorization phase. Rigorously speaking, RADIUS does not have a separate authorization process. It simply downloads some sort of authorization profile after successful authentication. The baseline router configuration documented in the previous post works for several Auth-proxy environments. The definition of the RADIUS attributes to be sent to the router takes place on the server side (typically Cisco Secure ACS or, more recently, the Identity Services Engine). In a previous article, “Cisco Firewalls and user-based access control“, we revisited the concepts of Authentication, Authorization and Accounting (AAA), and mentioned that both the Cisco ASA and Cisco IOS firewall families can be configured to create connections taking into account some kind of user information. The current post builds upon that discussion and presents the Authentication Proxy (Auth-proxy) feature, which constitutes the basic instrumentation for user-based features on Cisco IOS routers. In our particular example, Auth-proxy is triggered by telnet (because it is “a very easy to understand and document” protocol). It is interesting to know, though, that Auth-proxy is also supported over FTP, HTTP and HTTPS. It is relevant to emphashize that Auth-proxy is actually borrowing the authentication capability embedded in one of these application protocols to obtain user credentials and hand them to the RADIUS process. By intercepting a protocol that natively includes authentication, the router can now talk to the RADIUS server and receive (for valid users) an Authorization Profile that reflects the user privileges. The process is summarized in figure 1. When used as a standalone feature, Auth-Proxy is stateless in nature. Auth-Proxy can be rendered stateful when combined with Context Based Access Control (CBAC) or the Cisco Zone-based Policy Firewall (ZFW). In this last case, we will have the so called user-based Zone Firewall. Play with the other triggering protocols (HTTP, HTTPS, FTP). The user experience for HTTP/HTTPS is very similar to that of Wi-fi hot spots: after getting the user credentials (frequently through a web browser prompt), and correctly authenticating the user, access is granted. Why should HTTPS be a particularly interesting option ? Stay tuned: other articles will cover mode details about Authorization Profiles. 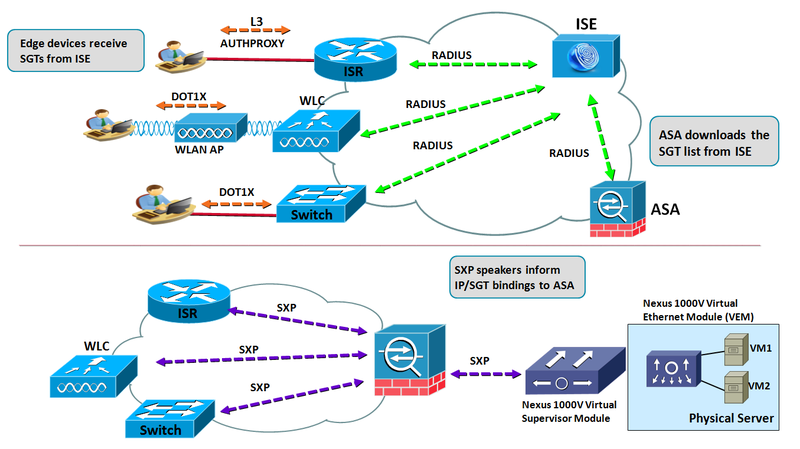 The current post concentrates on the creation of rules that may include, not only the IP addresses of source and destination systems interconnected by Cisco firewalls, but also identity information related to the users initiating the connection requests. Before we start creating this new category of rules, it is advisable to get familiar with a set of relevant concepts. Accounting relates to the question “what the user did ?”. Through this process, the accounting client collects user activity information and sends it to the accounting server. Control of regular users that need to pass traffic through the firewall: the mechanisms employed by Cisco firewalls to materialize this functionality are the Cut-through Proxy (on ASA family) and Authentication Proxy (on IOS). RADIUS is optimized for this type of task. Control of administrative users that are required to configure and monitor the devices themselves. TACACS+ is optimized for the tasks that involve command authorization and accounting. The following figure summarizes typical questions that should be answered before you start configuring user-based access control through the firewall. Other posts will detail some of the available solutions.